Posted by claireblang in 2009 Season, Listeners, My Show, NASCAR. I just arrived at Infineon Raceway and am setting up my home away from home in the studio here at Infineon Raceway. I got a bunch of email about whether I’m going to Wisconsin and the Milwaukee Mile again this weekend instead of Infineon which has been the mode the last couple of years. This year, while my heart will be home with family and friends I’ve met in Milwaukee, I’ll be situated in the Sonoma Valley covering both races. Since I am in the booth for the pre race show it would be hard to anchor the show from a bar in Milwaukee across from the Milwaukee Mile. But it sure was fun wasn’t it? I’ll figure out a way to do that again one day – but this weekend I’m in the beautiful Sonoma Valley. Dialed In – 11-1 p.m. EST leading up to the start of the Sirius NASCAR Radio Pre Race Show. NOTE: See the photo of John in Louisiana’s landing spot (he’s the guy who made the bet with me last week that Dale Junior would finish in the top ten at Michigan. He lost the bet so he is going to send me a photo of him with a sign indicating he lost and with at least one of the oil rig guys near the helicopter and the sign. 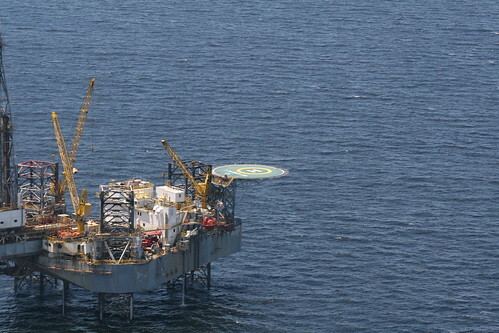 Check out where John has to land his helicopter when he shuttles the guys to the rig each day woah! Read these Billy Joel Lyrics and then my notes below it. The song “Pressure” by Billy Joel summarizes the state of drivers and team members in the sport headed into this weekend’s race here at Infineon. It struck me of late that when I am live with the winners in victory lane how many drivers and crew chiefs are now talking about the great vehicles that the manufacturer that they race for puts on the show room floors. Arm chair quarterbacking after the fact is always easy but maybe some more of that should have been going on before the economic crisis hit Detroit’s big three. Tough times teach us a lot – and I always say when times are tough the Good Lord is preparing us so that we’ll be humble when we win the lottery. Good times are coming. What lesson are we supposed to learn at this juncture? Am I the only one who thinks that some of what we have experienced, yes even in our sport, has made us appreciate it more? While GM teams ponder where to cut back to assist GM in their restructuring while professing long-standing support to Chevrolet – sponsors looking ahead to renewing or signing contracts with the sport look to the performance of teams and drivers like never before. Team members are uneasy, not sure where budget cutbacks will come from and hoping this is not the weekend that they mess up. Team owners and drivers say that they are resourceful and I agree. No one has seen yet what teams and drivers and crew guys will do to make teams thrive in tough times. I think it’s not like anything you’ll see in other sports — I think the resourcefulness of folks on NASCAR teams (creativity is what made winners in the sport) will lead to decisions that no one has yet thought of. Other sports – No I don’t see that resourcefulness not to the level of what will come from decisions made in tough times by smart team owners. Add to that the loyalty of the true fans and even in tough times, maybe more so in tough times, the sport will find a way. The pressure to perform which has been a part of this circuit forever is ramped up to a level these days that will absolutely affect the racing -perhaps for the positive. This is not the time to be mediocre and survive. This is a time when funding is on the line like never before and no one can race unmentioned at the back of the field and stay in the game for long with sponsors looking for the payback on every penny to justify the spending to boards of directors. Does NASCAR give the payback to sponsors? With everyone on their game yes – and the game will be stepped up. Drivers and team members know that, and since these guys (team members) do not dwell on the negative but rather the perpetual series of opportunities for hope that each race presents – they are not talking about it much. Where will the cutbacks come from? What programs, what team members and are layoffs in the future for these teams? These questions are inside, unsaid within the sport this race weekend. Those answers are yet to come. Team owners are positive and loyal and they will find a way. But as we head into this weekend -even more so than ever…for many in the sport – there is more pressure. Welcome to Sonoma. It’s going to be a heck of a race. Posted by claireblang in 2009 Season, My Show, Trackside. Welcome to Bristol Motor Speedway! Dialed in – (Friday, March 20) (Pre Qualifying) LIVE from Bristol Motor Speedway – A 3:00-3:30 pre qualifying show leading into Sprint Cup Series Qualifying. Dialed In – (Friday, March 20) (Post Qualifying) LIVE from Bristol Motor Speedway 7-10 p.m. EST Regular Friday night Dialed In. Post Race Show (Sunday March 22) (CBL in Victory Lane) following Race. I don’t know how many of you got to hear the “Suitcase Jake Elder” audio that I found at my house over the weekend. I interviewed the infamous crew chief in 2001 and did a special on him. But because of music rights I was not able to re run the special and had to find the raw tape in my audio vault. I have almost an entire room of mini disks from various years and have decided to go through it. This is no small task. I was thrilled this weekend when I found the audio of the interview I did with Jake. I had gone to his house to interview him – and since he was out of the sport by then had never met him. He popped me a beer and started talking. It was an interview that will now be preserved forever and I am so thrilled that I found it. He’s in a nursing home now – but his stories live on forever. And man, can he tell a story. He’s amazing. Suitcase thanks for the stories. The stories of this sport and how the drivers and the crew chiefs and team members told them, leaning on tires, or on long drives to the race track before they had private jets are part of the storied history and fun of this sport. You sense when you talk with someone like Tony Eury, Senior and a list of others from the golden era that they know how to tell a story – how to truly enjoy laughing at someone elses and how to repeat the good ones just right in the garage. I value that about our sport, the story telling. I also treasure that in 2001 I got to talk to a man named Jake Elder in a one on one interview that was about as compelling as any interview I’ve ever done. I value more that by finding the tape his story will live forever in history. Here’s to you “Suitcase” Jake. Posted by claireblang in 2009 Season, My Show, NASCAR. “Dialed In” with Claire B. Posted by claireblang in 2009 Season, My Show. Greetings friends from my studio in Charlotte, NC! I wish you all many blessings in this New Year! Thanks for all the nice emails and instant messages with wishes! You all mean a lot and I appreciate it greatly. To all of you – thanks for following the show and keeping in touch with me and for the friendship and great racing conversation via email and on the air over the past year. Now, as we pack away the holiday trimmings — and welcome in what I hope is a positive New Year for all of you -it’s time to go racing isn’t it? I promised that when I was about to go back on the air I’d write and let you know. Although formal announcements are forthcoming I have a lot going on and have a major role in SIRIUS NASCAR Radio starting next week and I wanted to keep you all posted. Hopefully, many of you were able to hear the LIVE broadcasts of “Dialed In” when I was in the SIRIUS Studios in New York City for Champions Week in December. I hope you enjoyed the special broadcasts. Yes…. I’ll be anchoring “Dialed In” as well – and the first official “Dialed In” show will be at 7 p.m. this coming Wednesday on SIRIUS NASCAR Radio channel 128 and on XM for “Best Of” subscribers on the “Best Of” SIRIUS channel 128. As I said, I will be extremely busy taking you live everywhere on SIRIUS NASCAR Radio that special events are going on and very busy taking my show on the road covering the NASCAR circuit this year again. I will be leaving for Nashville on Friday and broadcasting “Dialed In” Friday and over the weekend from “Sound and Speed” from the SIRIUS XM Studios in Nashville. I love taking you into live events and to race shops and broadcasting from the track where action is happening. I will be doing that as well as “Dialed In” in 2009. It’s going to be exciting to take you on the road and to events with me and whenever I have news breaking you will hear it on the channel – and I’ll be checking in each night at 7:00 p.m. EST once things start rolling. As to how the holidays went – thanks for asking. First off, my birthday is not January 1 and any information on Facebook as to my birthday was totally incorrect. This blog (Claireblang.com) is posted on the social networking sites but since I did not update my personal information – somehow the sites computer automatically put January 1 as my birthday and tons of you sent me emails wishing me a happy birthday. My birthday is in August so thanks for the wishes but I am not a New Years baby! 🙂 Geeze how many birthdays does someone need in a year? The other thing that I wanted to write about was all the economic woes that the sport is going through that seem to be the main and sometimes only story line topic everywhere you turn. While I have spent a great deal of time covering the economics of NASCAR and I have so many friends who are affected within the sport —people are hurting everywhere. Every business and every sport and seemingly every American is affected. What we need now is not to ignore the economic story – of course not –It’s major –but to get back to covering more than just the easiest picking off the story tree and focusing only on that. I’d like to get back to covering racing and my wish in 2009 is that we start to see a turnaround in the economy in general for you all- that we start to see any inkling in our lives that we can begin to enjoy sports again – and that we can start to pick up the pieces, all of us in America, and turn things around. I think we do that by working hard. We do that by being extremely thankful for our blessings if we have a job and helping others if we know people who do not. We do that by finding things about whatever sport we enjoy (football, basketball, hockey) to give us something besides the grim news to talk about. I am a positive person by nature and I am feeling deep inside that it is my job to work harder to find compelling stories that have not been told yet about players in the sport, and to tell those stories the best that I know how. My commitment in 2009 is that I want to take you live to more events than you could possibly ever go to anywhere else other than SIRIUS NASCAR Radio. I want to take you inside, make you feel as if you are at the parties and inside the shops and at the special events and I want you to know how important you are as we share stories and wrangle and debate and laugh and enjoy another season inside this sport. I want to keep seeking to be unbiased and fair – and to find more sides to a story than just a simple opinion. I’m excited to be back on the air and I will have so much to tell you when I return this coming week. Again thanks for the friendship. A shout out to all my friends in racing, both those who are in the sport and those who lost jobs and are waiting to find positions to return. And, a shout out to all of you coast to coast no matter where you live and no matter what you do for a living. Your story is important too. I’ll catch you back on the radio this coming week on SIRIUS NASCAR Radio, Channel 128. Happy (Not my birthday :)) New Year to all of you! P.S. Can’t wait to talk with you again on the radio. Stay tuned for more news on this blog and for me to be writing here more in 09. I got a digital camera today so that I can post more up to date and inside photos on this site…so get ready for that as well. Posted by claireblang in 2008 Season, Drivers, My Show, NASCAR, Teams. Hey all! Greetings from the Big Apple! I’m blogging you from the Sports Business Journal Motorsports Marketing Forum at the Westin Hotel at Times Square. Tonight I will be broadcasting (Sirius NASCAR Radio and BEST OF Sirius on XM) Channel 128 LIVE from the Sirius studios in Manhattan – from 8-11 EST. I’ll have a recap of the day here in New York City and I hope you can hang out. Last night on “Dialed In” (Sirius NASCAR Radio) I told you all that the media have been asked to rank the competition stories from 2008. Several of you called in and asked if I could put the list on the blog so that you could help rank them in order of importance in your mind. Here’s the list (below). Listed in no particular order are the nominees for the top stories of the 2008 NASCAR season. The media members have been asked to rank all 17 moments in order. What do you think? • Jimmie Johnson wins his third consecutive NASCAR Sprint Cup Series championship, becoming only the second driver in history to accomplish the feat. Johnson’s championship performance is highlighted by his strong showing in the Chase, as he posts three wins, eight top 10s, six top fives and an Average Finish of 5.7. • The new NASCAR Sprint Cup Series car concludes it transition year and is raced the entire season. • Kyle Busch excels in all three national series, winning a combined 21 races in the NASCAR Sprint Cup Series, NASCAR Nationwide Series and NASCAR Craftsman Truck Series. • Tony Stewart announces he’s leaving Joe Gibbs Racing to become owner/driver of Stewart-Haas Racing in 2009. Stewart won two NASCAR Sprint Cup championships during his 10-year tenure with JGR. • Carl Edwards wins a NASCAR Sprint Cup Series-high nine races and finishes runner-up in both the NASCAR Sprint Cup and NASCAR Nationwide Series. • Johnny Benson edges Ron Hornaday Jr. to win the NASCAR Craftsman Truck Series championship in the second closest points battle in that series’ history. Benson joins Greg Biffle as the only other driver to win both the NASCAR Craftsman Truck Series and NASCAR Nationwide Series titles during their careers. • In his first season driving for Hendrick Motorsports, Dale Earnhardt Jr. breaks a 76- race winless streak by winning at Michigan International Speedway on Father’s Day. Earnhardt Jr. finishes 12th in points with one victory, 10 top fives and 16 top 10 finishes on the season. • Jeff Gordon’s streak of 14 consecutive seasons of winning a race is snapped as he goes winless in 2008. • Clint Bowyer wins the NASCAR Nationwide Series championship and continues to establish himself as one of the rising stars in the sport. • Ryan Newman wins his – and owner Roger Penske’s – first Daytona 500, with teammate Kurt Busch finishing second. It is the 50th running of the Great American Race. • After being voted into the field by the fans, Kasey Kahne wins the NASCAR Sprint All-Star Race and rides that wave of momentum with a victory the following week in the Coca-Cola 600. • Joe Gibbs Racing’s No. 20 Toyota wins the NASCAR Nationwide Series Owners’ Championship, claiming nine victories with four different drivers during the season. • Eighteen-year-old Joey Logano bursts upon the national series scene, competing in 19 NASCAR Nationwide Series events, winning at Kentucky Speedway and posting 14 top 10 and five top five finishes. • Greg Biffle wins the first two races in the Chase for the NASCAR Sprint Cup and re-establishes himself as a championship contender after a two-year absence from the Chase. • Canadian Ron Fellows not only wins in his home country but does so in the rain at Montreal’s Circuit Gilles Villeneuve in August. The event is NASCAR’s first-ever national series points race contested on rain tires. • The announcement is made that Camping World will become the official sponsor of NASCAR’s Camping World Truck Series beginning in 2009. Craftsman had been the official sponsor since the series’ inception in 1995. • NFL standout Randy Moss enters the NASCAR Truck Series as owner of the No. 84 Randy Moss Motorsports Chevrolet Silverado. I’d better get back to the seminar. Posted by claireblang in 2008 Season, My Show, NASCAR. Image via WikipediaHey All! Greetings from New York City. Thanks for all the emails and for keeping in touch. Hope you had a great Thanksgiving. I wanted to write you a note and let you know when I will be broadcasting on Sirius NASCAR Radio (Sirius Channel 128 and XM Best Of Package 128) here in New York City for Champions Week and post the schedule. I arrived today (Monday) in the city and will be on site and in and around the city covering and hosting live broadcasts at the events all week long – and I’ll be hosting a special wrap up show at the end of each day. Featuring: Exclusive interviews with the entire #48 team including Jimmie Johnson, Chad Knaus, Rick Hendrick and the rest of the Championship team, plus the listeners will have a chance to call the show LIVE to talk with the team! I am slamming getting the show ready and getting used to the different layout in this studio. I’m looking forward to hearing from you on air tonight and sure hope you can catch the shows from New York City. Posted by claireblang in Breaking News, My Show. I wanted to let you know how much I have, over the years, appreciated your friendship, support, loyalty, calls on the air, race rants, observations and the good times we’ve shared over the radio on “Dialed In” on XM. It may be that some of you are now SIRIUS subscribers, that you got the “Best Of” package and can get NASCAR Radio now on XM or that you have been listening every day and are tried and true loyal XM’ers. When I decided to stay at XM back when NASCAR Radio moved to SIRIUS, I thought of you – of how many radios you already had purchased and I stayed. Many of you did too and I’ll never forget your kindness and support during that time. Many of you moved with me from XM channel 144 to 148 when they moved the show after the merger and I was truly amazed. When they moved me again to channel I43 I figured it would be really tough for you to find the show – but you moved in droves and sought out being a part of “Dialed In” again. I was humbled. I promised that you all would be the first to know what would happen to “Dialed In” when the two services merged. Now, finally I can tell you. On December 1, 2008, I am going to be moving to SIRIS NASCAR Radio on The “Best of” Channel 128. “Dialed In” will once again, be a part of the line up on Sirius NASCAR Radio. I will be anchoring coverage at the race track, on weekends, doing specials and “insider” coverage as well as doing “Dialed In” during the week. I will be returning to the radio channel that I helped to launch when NASCAR Radio first began. I was so proud of helping launch the initial NASCAR Radio channel and I’m happy to be returning to it now. I will kick off being a part of SIRIUS NASCAR Radio on Monday, December 1 at the Sirius XM Studios in New York City. I’ll have a special show each night after covering all of the press conferences, parties and insider events that NASCAR will have during Champion’s Week in NYC. I’ll take you behind the scenes as if you are actually at the events yourself. Plus, I’ll host an exclusive show with the entire Hendrick Championship team, featuring Jimmie Johnson, Chad Knaus, Rick Hendrick and their entire crew! My main concern now is that no one tunes into XM Channel 143 on Monday, December 1 looking for “Dialed In” and is disappointed not to find it. We have been moved many times and I worry that some of you may be looking for my New York City Champion’s Week coverage on the channel I have been on the past several weeks. If you have SIRIUS Make sure to update your radio pre-set to SIRIUS NASCAR Radio channel 128 so you don’t miss one second of the show on December 1. If you have XM and you don’t have “The Best of SIRIUS” on your XM radio, you can get it today by logging onto www.xmradio.com/best or by calling 888-5-SIRIXM (that’s 888-574-7496) right now. I have been blogging here on Claireblang.com to keep you all posted so be sure to keep up with what is happening with me and the show behind the scenes by logging on here for all of the details! In closing, It’s hard for me to tell you what you have all meant to me over the years. If you are a regular listener then you know how much you matter to me. I most often travel alone on the road although I have friends on the circuit. But most times I am alone in a studio in a city away from home and when I click on the ISDN broadcast line you are there. You are my friends, my neighborhood and my listeners and you all matter a lot to me. You have shared much with me over the years and I wanted to make sure that you were a part of the latest chapter of my life. Thanks for everything! I’m lucky to have had listeners like you. I hope to hear from you on Monday, December 1 at 7:00 p.m. EST when I sit down behind the microphone in the Sirius studio in New York City for the very first time to kick off Champions Week coverage. Many blessings and happy Thanksgiving to you and your family. Thank you for your loyal, support and friendship. Posted by claireblang in 2008 Season, Help Out, My Show. I received a follow-up email from Jason’s girlfriend. My friend Gabe Calton gave me your email address. I am Jason Deel’s girlfriend of 3 years. This has been the hardest thing I have ever been thru. Jason and I are more that we are best friends. We’ve been to so many races together we live close to Bristol and have season tickets we go to charlotte and other places. 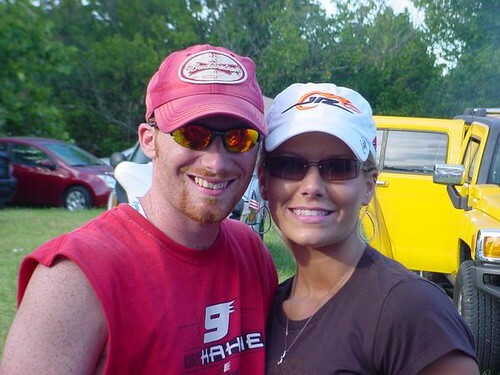 Jason loves nascar so much and he would appreciate all the prayers. If anyone wants to send E-Cards they can go to http://www.ohiohealth.com/homegrant.cfm?id=321 and click send E-Card he is in Grant Medical Center. I attached a photo of Jason and I today at the last Bristol race. He has a Kahne shirt on but dont get me wrong he is a GORDON ONLY fan 🙂 he lost a bet and had to wear the Kahne shirt. Posted by claireblang in 2008 Season, Fun Stuff, My Show, NASCAR. Today I am broadcasting live (3-6 EST XM Channel 148) from the Brickhouse Tavern – in Davidson, NC (209 Delburg St.) LIVE in the Chevy Mobile Broadcast Unit today – broadcasting live from the first official “Jail and Bail” raising money for the Brienne Davis NASCAR Technical Institute Scholarship Fund. Brienne was a Universal Technical Institute graduate and a NASCAR official who was killed in a car accident six months ago today (April 8th). The NASCAR community – drivers, crew chiefs and crew members and officials have rallied to raise money today for a scholarship fund in her name. If you can come enjoy the music – meet the participants and help bail out the likes of Tony Stewart, Juan Pablo Montoya and others. If you can’t come listen on the air on Channel 148 and we’ll tell you how can participate. I have had so many emails and instant messages regarding the finish of the race at Talladega – and I am going to post more of them later tonight. I’ve been busy on location – last night at Dale Earnhardt Inc. and tonight at the Jail and Bail. Nascar keeps changing the rule. How many races is NASCAR going to let Goodyear ruin before they either bring in some competition or a different manufacturer to make tires that do not determine the outcome of the race. After the debacle at the Brickyard earlier this summer, I, personally, would have thought that Goodyear would have been going above and beyond, even making a tire that was too hard, to make sure that tire failures did not affect the outcome of another race this season. Tire failure not only affected the outcome of the race this past weekend, it may, ultimately, have affected the outcome of The Chase and who the champion will be. The luck of the draw and whether the driver received a set to tires that wouldn’t inexplicably EXPLODE was very much present on Sunday. Denny Hamlin spent the night in a Birmingham hospital on Sunday after his tire exploded. This shows not only the frustration that the exploding tires was causing, but also the danger. Four drivers were either starting backup cars or had crews that spent extra long hours fixing their cars Friday & Saturday after Dale Jr. had a tire blow up during practice on Friday. As a fan who wants to see the drivers determine the outcome of the race and not their tires, I believe that Goodyear should be on extremely thin ice with NASCAR. I have been a little disconnected from the whole world the past two weeks. So Monday when I actually was able to get to my XM and couldn’t find your show I freaked. I am happy to have found you on your new station. Knowing that it was going to be a good one after the race on Sunday. I hate that I missed it but am sure that there were a lot of unhappy/happy people. I am one of those fans that was very excited to see Tony get a win (first of the year) as well as his first at Talladega.. GO Tony.. Tell Regan that he wouldn’t of wanted to get a win this way people would of questioned him getting his first win with an illegal pass. When people talk about his first win he wants it to be because without a doubt he earned it. Keep your chin up Regan it will come and then you will give people something to talk about. SEND THAT 20 AROUND WOO HOO….. I think Nascar should make the rule for all tracks and noit just the super speedways. This way it is the same rule for all the tracks. I believe Nascar has more important problems to fix. Luckly they have not had anyone hurt in the big one yet, they need to look at how to break up the big packs before someone is. I don’t want to see that happen but if you play with fire or are bound to get burnt. Kudos to you for being there with Regan where the real story is, and kudos to Regan. Regan, You have made a name for yourself! Now I can place a face with the firesuit. I and the Biff agree that you were robbed. Did you notice how subdued the interviews were on NASCAR Victory Lane? I will be rooting for you! this, the madder I get. That call was a joke, once again! and force your opponent below the yellow line and you win. wrecking a lot of good cars trying the inside and holding his line. frustrated with this sport I love. wouldn’t go so far as to say there was a conspiracy theory that NASCAR wanted Tony Stewart or a big name to win the race, however, do you (or others) think that if the move pulled off by Regan Smith would have been pulled off by a bigger name that there would have been a different ruling? In the NBA there were the Jordan Rules where we got the better calls by officials and I’m just wondering if a guy like Regan doesn’t get the benefit of the doubt like others would. Please tell your listeners that the Talladega horse is dead, move on, get over it, it’s a done deal. TONY WINS!!!!!!!!!!!!!!!!!!!!!!!!!!!! never win a race in a Toyota! I’ll post more of the hundreds of emails that I have when I get off air tonight. Take care…raining in Charlotte…pouring in fact. How much money will it take to bail out Tony here tonight? Posted by claireblang in 2008 Season, Drivers, My Show, NASCAR, Teams, Trackside. Saturday – September 20, 2008……….3:00 p.m.
It’s Saturday afternoon and I’m in the radio room right behind the stage in the deadline room here at Dover International Speedway. NASCAR just held a news conference announcing their new substance abuse policy. NASCAR will do random testing of team members, officials and drivers beginning next year. Drivers have been in support of random testing in general for some time now. The reporters in here are debating the new policy because it doesn’t specify the substances that are banned from NASCAR. There are two sides of the room – one says that a policy that doesn’t tell a guy what is banned specifically is open to lawsuits etc. Some say those media members are totally missing the point. Which is that NASCAR prohibits the misuse or abuse of any drug period – could be cough syrup could be anything. The problem with lists of substances, NASCAR says, is that it restricts what you can look for – this policy is open to abuse of anything that would affect a driver’s ability to be safe on the race track. Drivers are saying this is not shooting hoops or hitting a fast ball – that anything that affects a driver’s ability should be off limits because it’s life or death. The saying above from Bill France, Sr. about hesitation is well documented – it’s painted on the wall at Pocono Raceway. Somehow on a cool Saturday in Dover the part about bleached bones for those who hesitate within the grasp of victory is compelling. It’s a motivator for sure to kick the cobwebs out and make something happen. That’s just what some teams need to do to stay in the chase this weekend. Jeff Gordon and the 24 team are on the pole and I have gotten so many calls on air and emails from Gordon fans saying they hope that the pole is a sign of good things to come. I have to say that there was some confusing information circulated regarding Gordon testing with his team this past week at Kentucky. After qualifying Gordon confirmed that he was, indeed, at the test himself despite a trip to Washington DC. Good for Gordon. I still maintain that they have a better test session and are more successful if Gordon can get to the test himself. It’s a positive move that he rearranged his schedule to be at the test instead of letting Keselowski do it for him. Sunday with The Fallen Firefighters at Dover! I volunteered to pitch in and emcee hospitality tomorrow for the over 500 supporters of the Fallen Firefighters Foundation —-in support of the over 100 firefighters who lose their lives each year in the line of duty. The track asked if I’d help out and how cool is it that guys like Jeff Burton and Richard Childress volunteered to speak to them on their own time. Of course I’ll pitch in – I’d be honored. It’s a small, small thing to do to pay back those who serve and protect. At the races here at Dover, by the way, over 250 fire and EMS Crews work to keep drivers, crews and fans in attendance out of harms way. Steve Hallam, a 56 year-old-Englishman will leave his post as Head of Race Operations for McLaren Racing and join MWR’s NASCAR Sprint Cup Operation following the conclusion of the Formula One season. Hallam has established himself as a respected engineer and manager of the past 27 years in Formula One, participating in 430 Grand Prix, winning five World Championships while working for only two teams: Team Lotus and McLaren Racing. Hallam has worked as Race Engineer with such world-class drivers as Nelson Piquet, Ayrton Senna, Nigel Mansell, Michael Andretti, Gerhard Berger, Mika Hakkinen before moving on to become Head of Race Operations. In this role he developed a group of the most capable trackside engineers in Formula One resulting in Lewis Hamilton’s current challenge for the Formula One title, a four-time winner this year who is leading the World Championship Driver Point Standings. TED MUSGRAVE – HT Motorsports – Las Vegas – What is the deal? Ted Musgrave and team owner Jim Harris, owner of the No. 59 Team ASE/HT Motorsports Toyota Tundra, have mutually agreed to part company effective immediately. Stacy Compton will replace Musgrave for Saturday’s Qwik Liner Las Vegas 350 at Las Vegas Motor Speedway. Compton was HT Motorsports’ first driver in NASCAR Craftsman Truck Series competition, competing in four races in 2001 and three races in 2002. 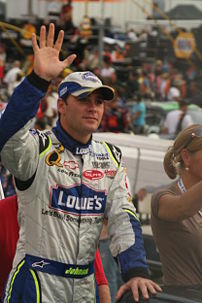 He scored top-10 finishes in his first five starts with the team, including a fourth-place finish after starting from the pole at Phoenix in October 2001. The drama is everywhere in NASCAR. I’ll keep you posted. I put up some new emails in the Claire’s email bin above. Check it out. Thanks for finding me on the new XM channel # 148 and new time 3-6 EST. You all rock! Greetings from Dover!